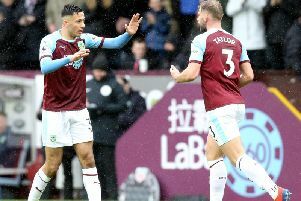 Chris Woods first Turf Moor goal for the Clarets was enough to secure all three points for Burnley. How's Scott Dann not levelled things here?! From Cabaye's cross Scott Dann unmarked at the far post somehow heads wide, unbelievable miss. Nick Pope punches away a long range effort from Yohan Cabaye. What an important block by James Tarkowski on the line to deny Scott Dann. Big save from Nick Pope, that will do his confidence the world of good. Benteke runs free on goal but Pope makes himself big to deny the Belgian international. Yellow card for Benteke after a late shove on Tarkowski. Ashley Barnes forces a fine save from Hennessey cutting inside and curling an effort to the Palace keepers right. The initial corner is cleared but from a long ball back into the box Jeffery Schlupp volleys well over the bar. Andros Townsend finds the head of Lumeka who heads wide, somehow the referee awards a corner kick. Ashley Barnes flicks on Nick Pope's long kick but Chris Wood can't get his feet untangled. Burnley sub: Ashley Barnes replaces Sam Vokes. Crystal Palace sub: Levi Lumeka replaces Chung-Young Lee. Jack Cork blocks an effort from Andros Townsend. James Tarkowski does well to charge down a Palace effort from distance, Clarets yet to get going this half. We're back underway at Turf Moor, no changes for either side. Teams back out onto the pitch ready for the second half. Gudmundsson does well on the wing to get the better of his man, Chris Wood can't quite get on the end of it. Three minutes of added time are announced. Burnley skipper Tom Heaton can't continue and is replaced by Nick Pope for his Premier League debut. Stop in play as Tom Heaton goes down after collecting a cross, looks like he's dislocated something, whilst that is going on referee Michael Oliver shows Robbie Brady a yellow card for a foul on Andros Townsend. Yohan Cabaye hits his free kick straight into the Burnley wall and the Clarets clear, poor free kick from the Frenchman. Free kick for Crystal Palace on the edge of the area. James McArthur gets up above Jack Cork but his header is wide to Tom Heaton's goal. Scott Dann looks to turn in the box from Benteke's knockdown but the Palace defender fouls Ben Mee. Chris Wood bursts through the Palace defence but can't get his shot on target, frantic start here at Turf Moor. Stephen Ward skips past the challenge of Joel Ward and crosses to the head of Sam Vokes, but the big striker can't quite divert it goalwards. Christian Benteke heads just wide of the post from Townsend's cross, good response from the visitors. GOAL! Loose ball from Chung-Yong Lee is seized upon by Chris Wood who dispatches his first Turf Moor goal. Jack Cork gets the game underway, Burnley in their traditional claret and blue shooting towards the Jimmy McIlroy stand, Palace in their all black away kit. Burnley and Crystal Palace make their way from the tunnel and go through the usual pre-match handshakes.